Environmentalists and Democrats often cite a “97 percent” consensus among climate scientists about global warming. 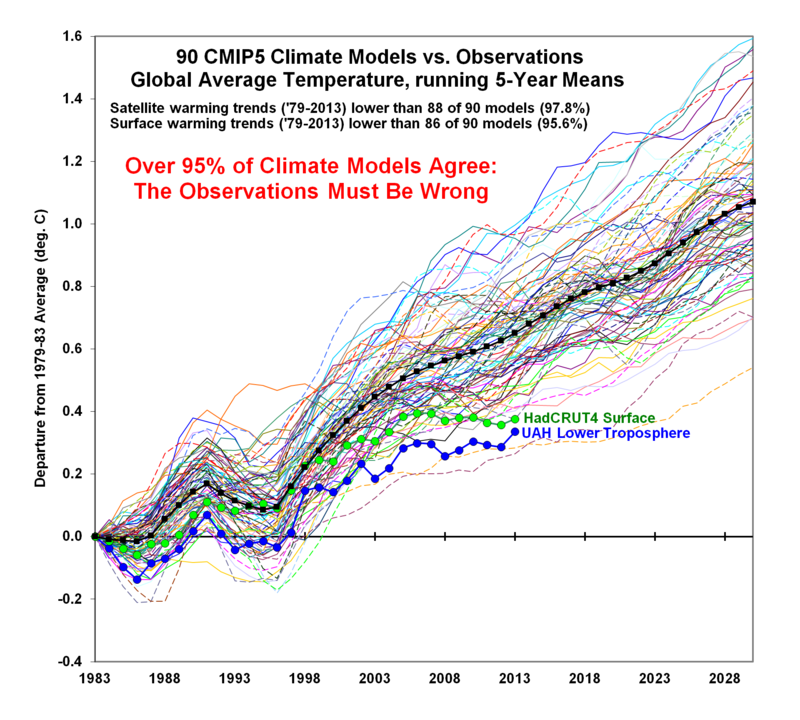 But they never cite estimates that 95 percent of climate models predicting global temperature rises have been wrong. “I am growing weary of the variety of emotional, misleading, and policy-useless statements like ‘most warming since the 1950s is human caused’ or ‘97% of climate scientists agree humans are contributing to warming’, neither of which leads to the conclusion we need to substantially increase energy prices and freeze and starve more poor people to death for the greater good. Yet, that is the direction we are heading,” Spencer wrote on his blog. Climate scientists have been baffled by the 17-year pause in global warming. At least eight explanations have been offered to explain the lapse in warming, including declining solar activity and natural climate cycles. Some scientists have even argued that increased coal use in China has caused the planet to cool slightly. But there does not seem to be any solid agreement on what caused global surface temperatures to stop rising. The latest explanation from climate scientists is that Pacific trade winds have caused the planet to stop warming. Stronger winds in the last two decades may have forced warmer water deeper while bringing cooler water to the surface. “The net effect of these anomalous winds is a cooling in the 2012 global average surface air temperature of 0.1–0.2 degree Celsius, which can account for much of the hiatus in surface warming observed since 2001,” wrote Australian researcher led by Matthew England of the University of New South Wales.